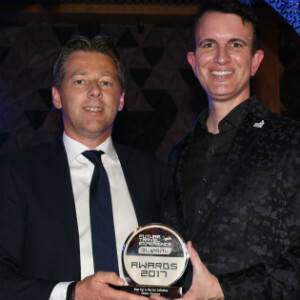 DOHA, Qatar, 2017-Sep-11 — /Travel PR News/ — Qatar Airways has been awarded the ‘Best Up In The Air Experience’ award for the third consecutive year and the ‘Best Baggage Initative’ award at the Future Travel Experience Global 2017 awards ceremony, held last week in Las Vegas. The ‘Best Up In The Air Experience’ award recognises the airline’s groundbreaking new Business Class seat, Qsuite, which has revolutionised the onboard Business Class experience. Qsuite features sliding privacy doors that allow colleagues, friends, or families travelling together to create their own private room, enabling them to work, dine or socialise together, as well as fully-flat beds, a do-not-disturb button and generous storage space. With the launch of Qsuite, Qatar Airways has also claimed the honour of being the first airline to offer a bed in Business Class. The airline was also presented with the ‘Best Baggage Initative’ award for its baggage management system, HAQIBA, developed in-house to manage all baggage-related activities across Qatar Airways’ extensive global network, including end-to-end real-time tracking for passengers. The HAQIBA system has also enabled the airline to achieve IATA Resolution 753 compliance at its Doha hub. Future Travel Experience Global 2017 (FTE Global) is one of the leading travel conferences worldwide, where representatives of airlines, airports and other travel industry stakeholders meet to demonstrate and discuss their latest customer experience initiatives. Airline Passenger Experience Association (APEX) Chief Executive Officer, Mr. Joe Leader, whose organization is a major partner of FTE Global, presented Qatar Airways with the prestigious award. The award-winning airline has received a number of accolades this year, including Airline of the Year by the prestigious 2017 Skytrax World Airline Awards, which was held at the Paris Air Show. This is the fourth time that Qatar Airways has been given this global recognition as the world’s best airline. In addition to being voted Best Airline by travellers from around the world, Qatar’s national carrier also won a raft of other major awards at the ceremony, including Best Airline in the Middle East, World’s Best Business Class and World’s Best First Class Airline Lounge. Qatar Airways will be adding many more exciting destinations to its network in 2017 and 2018, including Abidjan, Ivory Coast; Accra, Ghana; Canberra, Australia; Chiang Mai, Thailand; Utapao, Thailand; Chittagong, Bangladesh and Mombasa, Kenya, to name a few. Passengers will be able to go places together and discover Qatar Airways’ expanding network of more than 150 destinations, flying via the five-star Hamad International Airport in Doha. The national carrier of the State of Qatar is one of the fastest-growing airlines operating one of the youngest fleets in the world. Now in its 20th year of operations, Qatar Airways has a modern fleet of 200 aircraft flying to business and leisure destinations across six continents. This entry was posted in Airlines, Travel, Travel Awards, Travel Services and tagged Future Travel Experience Global 2017 awards, His Excellency Mr. Akbar Al Baker, Qatar Airways. Bookmark the permalink.